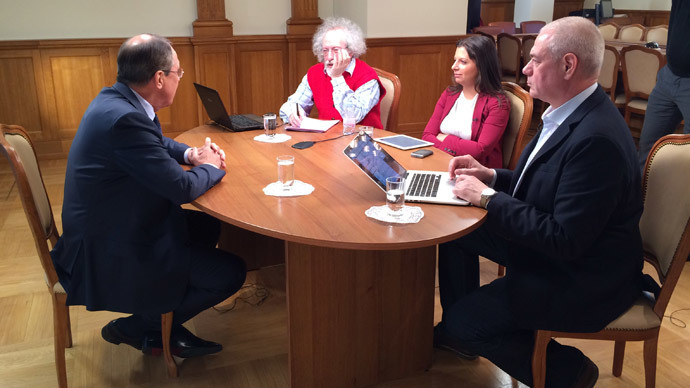 Russian Foreign Minister Sergey Lavrov is being interviewed by three major Russian radio stations. RT is exclusively screening the event, also aired by radio stations Sputnik Radio, Echo of Moscow and Moscow Speaks. Lavrov confirmed that he told former UK Foreign Secretary David Miliband not to lecture him during an intense conversation amid the 2008 Georgian crisis, but he didn’t use profane language to do so. The four-letter word did rise in the conversation, but that was a quote from a third person, who used it to describe then-Georgian President Saakashvili’s mental state. Miliband was trying to convince Lavrov to negotiate with Saakashvili. Barack Obama de facto admitted Russia’s justification in taking Crimea in his interview with CNN, Lavrov believes. The US president compared his own actions in the Ukrainian crisis to those of Vladimir Putin. He admitted that the US had been acting as a power broker since the start of the crisis while Putin improvised with Crimea, which proves that the US acted according to a plan while Russia responded to what it saw as genuine threat to the people of Crimea, Lavrov explained. The UN Security Council is more efficient than its critics give it credit for. The case, like Ukraine or the Israeli-Palestinian conflict, in which permanent members of the UNSC use their veto to block resolutions are widely publicized, while much more numerous examples when the security body successfully intervenes in conflicts in Africa remain in the shadow. “The Security Council was created for leading powers to agree between them. The veto right is part of this crisis management process,” Lavrov said. Russia is in a strong position to defend existing gas contracts with European consumers which the European Commission is challenging on antimonopoly charges. The contracts were signed before the EU introduced new rules under the so-called Third Energy Package, and standing international agreements forbid retrospective change of business contracts to the worse, Lavrov said. “We don’t have a goal to eradicate nuclear weapons from Earth. We have a goal to make the world a safe place. It means we have to take into account the military technology that was developed after nuclear weapons and that affects strategic stability,” he explained. The US rejected the Chinese-Russian proposal for an international treaty to ban placement of weapons in space. It didn’t ratify the Comprehensive Nuclear-Test-Ban Treaty, despite Obama promising to do so. It’s developing hypersonic vehicles that can carry conventional warheads. NATO far surpasses Russia in conventional weapons. All these factors and the global strategic antiballistic missile system would make further nuclear disarmament by Russia compromise its national security, Lavrov assessed. The US and NATO have hinted that they want to establish a mechanism to coordinate Russian warplane flights in international space close to NATO members, but have not applied for one formally, Lavrov said. Neither Iran nor Russia is interested in developing a full-scale military alliance, Lavrov believes. The two are already cooperating closely in fighting terrorism and other areas. “We received no propositions [for a formal military alliance] from the Iranian side. This is unrealistic and unnecessary,” the minister said.